cleaning alone will not permanently remedy the situation. 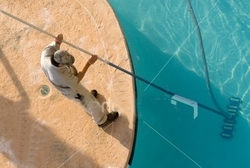 Extra chemicals may hold the problem at bay for a short while, but the long term answer is to have the pool professionally resurfaced by a licensed contractor. We have in house facilities for resurfacing. THE AVERAGE POOL SURFACE LIFE IS 10-12 YEARS AS STATED BY THE F.S.P.A.